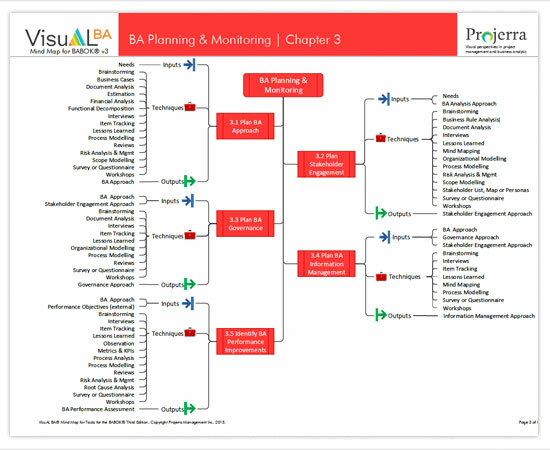 VisuAL BA® (Visually Assisted Learning for Business Analysis) is a suite of products that apply color, graphics, and interactivity to represent the relationships between the process groups, knowledge areas, processes and input/output documents in a visual manner. The graphical presentation allows you to see the associations between the processes and the various input and output documents. The interactivity enables you to explore the flow and connections between the various components. Experience the BABOK® with VisuAL BA®. Our popular VisuAL BA® Interactive Table combined with the VisuAL BA® Mind Map for Tasks and the VisuAL BA® Technique Usage Table. An awesome quick collection for those studying for the CBAP® or CCBA® exam who want to see associations. A great quick reference guide for professionals in the field. Purchase all 3 products and SAVE 15%!! The best way to help you recall the details of the BABOK®. A collection of tables (one for each knowledge area and several for the various techniques). The task tables provide a summary of the task as well as the elements, inputs, outputs, guidelines, tools and techniques associated with each tasks. The technique tables provide a summary of each technique as well as the elements, strengths, and limitations and usage of each technique. Hyperlinks have been included to help you navigate through the document for easy reference and quick access. Available as a PDF for you to print at home or use with your laptop or tablet on the go. An awesome tool for the visual learner who likes to jump to cross references for more detail! Is it difficult for you to remember all the inputs and outputs associated with the tasks defined in the BABOK? The colors, icons, and associations applied in the VisuAL BA® Mind Map for Tasks will help you visualize the relationships between the inputs, outputs, and techniques defined in the BABOK third edition. The mind map will make it easier to memorize all the details to pass the exam CBAP® or CCBA® exam. After graduation, continue to use the mind map to help you recall the details when you are on the job. Available as a PDF for you to print at home or use with your laptop or tablet on the go. Do you finding yourself wondering what business analysis technique should I apply now? Try this handy quick reference guide. One table to help you visualize and recognize which techniques are associated with each task. A second table to help you understand which techniques are utilized by each knowledge area. Available as a PDF for you to print at home or use with your laptop or tablet on the go. A great quick reference tool for the practicing BA or the aspiring student. With the recent release of the BABOK v3, we are undertaking that task of updating our product line. Please check back regularly for new products that will help you study in a VisuAL manner.